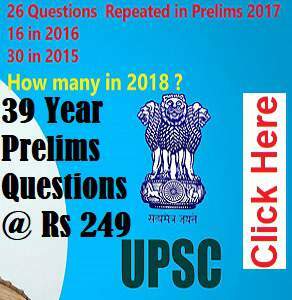 If you get UPSC Civil Services Preliminary Exam question paper now, how would you start? What would be your approach to UPSC Question Paper Solving? Would you start from Question Number 1 and move on until the 100th question or do you follow any other approach? How many questions would you normally attempt considering the negative marking involved? All these factors are very important, as a right approach can boost your marks, while a wrong or inefficient approach can cause you lose valuable marks (also a year!). All you need to clear prelims is right guidance and correct approach! ClearIAS has done a lot of analysis and practical workshops on how to help aspirants improve their potential prelims marks in UPSC CSE. 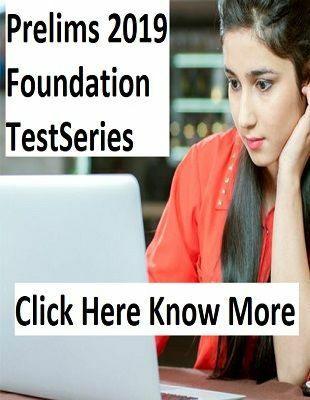 Suppose you are scoring around 100 marks out of 200 in the model exams for Prelims, you can increase it to 130+ level, by following some techniques and strategies which are really useful in any MCQ based exam. In this article, let us see how you can increase your efficiency in solving UPSC Question Paper. Yes, you can do that! 3-2-1-0 E method™: Use this approach to boost your marks! One of the most important approaches, which we will elaborate in this article is the 3-2-1-0 E method. This method can also be called the 100-50-33-25 percent method™. 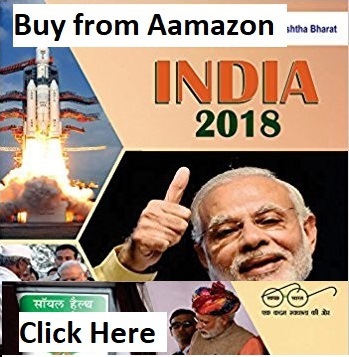 The essence here is to solve UPSC question paper in 4 stages – based on the number of answer choices you are able to eliminate. Don’t start solving questions at a stretch from 1 to 100, but rather use multiple rounds. The stages in 3-2-1-0 E method are called 3E round, 2E round, 1E round and OE round. In round 1, solve questions which you are 100% sure. If you have eliminated 3 options out of 4, you are left with only one option, which is obviously the correct answer. So in round 1, go for only questions in which you have eliminated 3 options. Ideally, you should get at least 35 questions with 100% surety, if you have studied reasonably well. Against every ‘3E’ category questions on the question paper, give a mark ‘3E’. In round 2, solve questions which are 50% sure. In other words, if you have eliminated 2 options out of 4, you are left with only 2 options, out of which 1 would be the correct answer. So in round 2, go for only questions in which you have eliminated 2 options. If the probability of getting a question correct is more than 25%, we strongly suggest to take a risk and attempt that question. 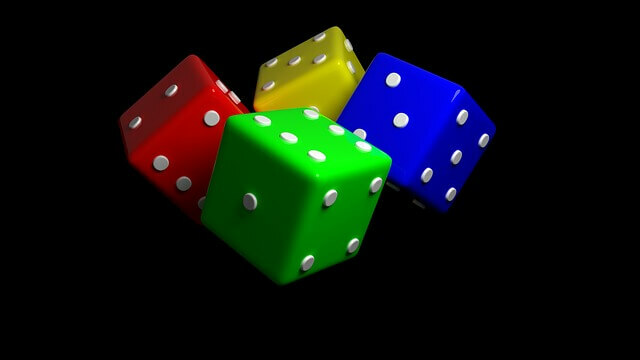 As per the statistical analysis, you have more probability of ending up with positive marks. These questions have 50% chance of being correct, which is much better than the above discussed 25%. Go for it, without any second thought. Ideally, you should get at least 35 questions with 50% surety, if you have studied reasonably well. Against every ‘2E’ category questions on the question paper, give a mark ‘2E’. In round 3, solve questions which are 33% sure (33% probability of getting right). In other words, if you have eliminated 1 wrong option out of 4, you are left with only 3 options, out of which 1 would be the correct answer. So in round 3, go for only questions in which you have eliminated 1 option. These questions have 33% chance of being correct, which is much better than the above discussed 25%. Go for it! There may be around 20 questions with 33% surety if you have studied reasonably well. Against every ‘2E’ category questions on the question paper, give a mark ‘1E’. Round 4 = 0E = 25% Sure Questions ie. Questions which you have no idea! In round 4, solve questions which you have no idea! But this also means you are 25% sure (25% probability of getting right). In other words, if you have eliminated 0 wrong option out of 4, you are left with 4 options, out of which 1 would be the correct answer. So in round 4, go for only questions in which you have eliminated 0 option. There may be around 10 questions which will be very difficult to answer, however hard you study. Against every ‘0E’ category questions on the question paper, give a mark ‘0E’. 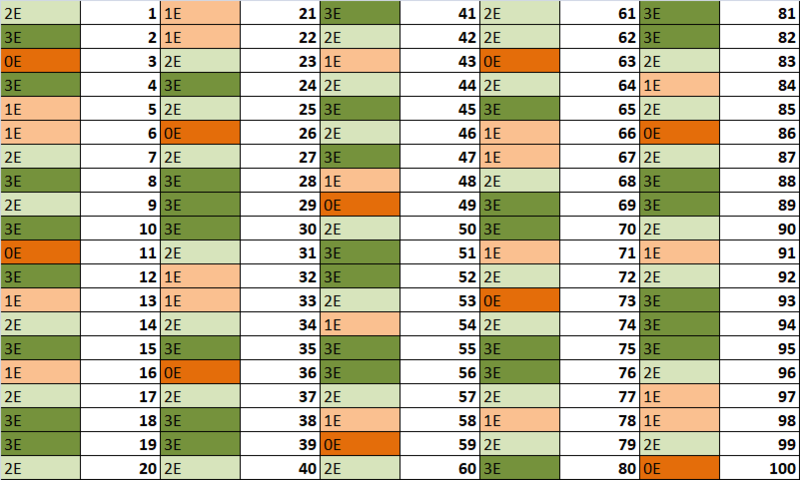 Analyse Your Responses – Count the 3E, 2E, 1E and OE! Give different symbols like 3E, 2E, 1E and OE each of these categories of questions on a paper (if the mock exam is online) or on the question paper itself (if the mock exam is offline). See the sample given above. Prepare a Chart like this for all mock exams! Before adopting this approach in the actual UPSC exam, you should test and master this method in the Mock Tests in ClearIAS Prelims Test Series. Then only, you can execute this technique perfectly in actual UPSC prelims. After following this approach, soon after each mock exam, prepare a chart like the one above. ClearIAS has 56 prelims mock tests for you to practice and perfect this approach. Once you enrol, you get access to already uploaded exams and upcoming exams in this year’s prelims test series. 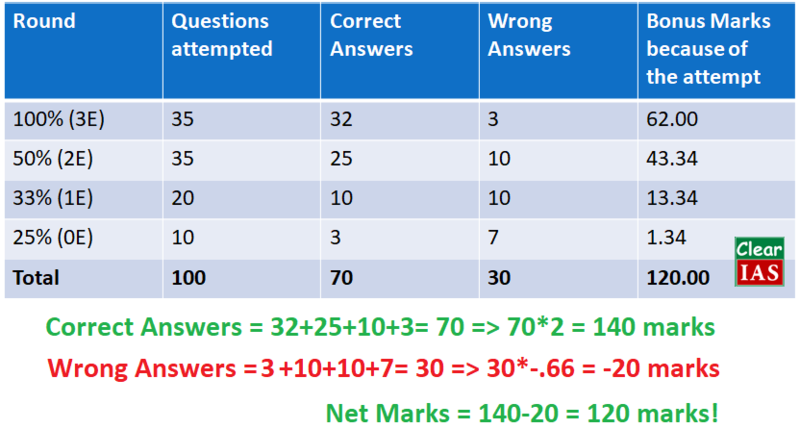 You would be surprised to the see the number of additional marks you gain, by attempting questions you don’t know in the ‘2E’, ‘1E’ and ‘OE’ categories. If you constantly get positive marks in these question categories ‘OE, 1E and 2E’ in the ClearIAS mock exams, increase the number of questions attempted to further increase your marks. If the number of questions attempted after the 3rd round is less than 80, it’s not a bad strategy to take some additional risk and go for a 4rth round to answer questions which you are unsure about all the 4 answer options. If you can correctly answer 3/10 questions of which you have no idea about, you will end up with a positive mark. Apply logic and common sense to eliminate the wrong options. Never marks answers based on random guessing. There should be enough caution to avoid negative marking. Don’t lose time by the extra work involved in marking additional data. Ideally, you should start bubbling at least by the 45th minute in the UPSC CSE Prelims. Happy Test-Taking!